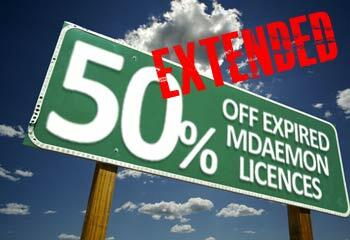 MDaemon expired licence promotion – extended until 31st October 2012! Are you an MDaemon user with an old expired licence? Would you benefit from better performance, two way synchronisation of any mobile device, a fast “desktop-like” Webmail client and more? Upgrade to MDaemon Pro version 13.0 this month and we’ll provide you with all of this, upgrade protection for another 12 months and free technical support, for 50% less than it would ordinarily cost! When you’re ready to make a purchase, enter the discount voucher below when prompted at the shopping basket stage…. For more information on what’s in the latest version of MDaemon you can visit the the Web site here, or if you’d like to speak to one of us about it by al means get in touch.